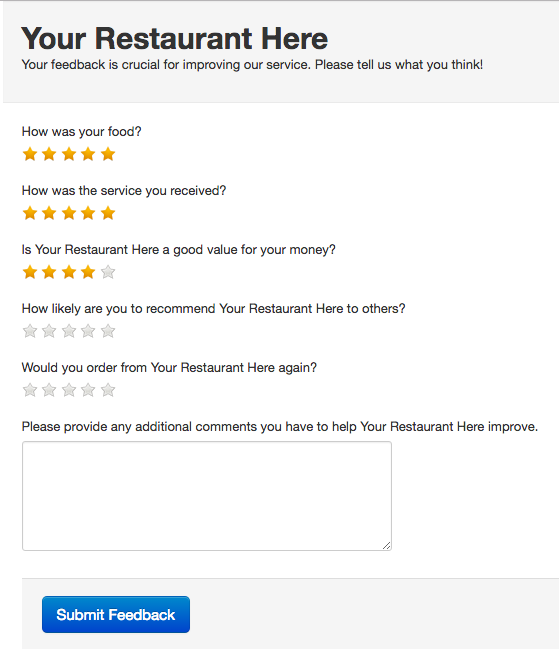 Making use of customer feedback is an essential tool to evaluate what is and what is not working at your restaurant. Customer feedback allows you to praise employees that give exemplary service and to aid those that are struggling. Feedback is the key to opportunities for improvement and to celebrate successes with your staff. One way to get feedback is by distributing customer comment cards. Every meal deserves the question, “How was everything?” This example from Main House BBQ shows how beneficial these cards can be. These cards are an easy way for customers to respond either negatively or positively at the end of every meal. 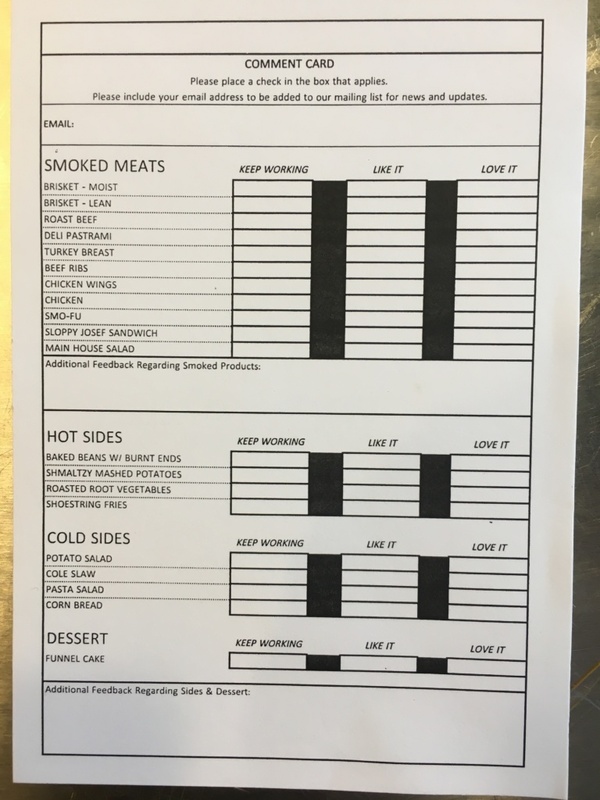 While some customers feel perfectly at ease expressing their dislike with a meal, some customers are not comfortable with verbally reporting a negative issue and a comment card is the perfect platform. Cards should be specific in questions they ask. Common questions should be included on the card such as menu selection, quality, pricing and service. The comment card above lets you rate specific dishes, and can give the restaurant an idea of what they are hitting out of the park and what is missing the mark. Allow an area for customer information such as mailing address, email and perhaps phone number. A card is a great resource for adding to your email or social media lists. You may want to leave space for additional customer comment. One of downfalls of a customer card or survey is the cost to print. Also if you decide to mail them to the customer there is that additional cost. Customers may also see filling out a card at time of service as inconvenient. Additionally, it takes time to collect data. The alternative to this type of feedback is of course online interaction with customers. Clearly Millennials live and breathe by social media and would prefer this method of delivery. Be advised that 80% of the workforce will be Millennials by 2020, making this age group your prime market. Part of the draw of social media sites is the amount of people that can be reached and the networking aspect. The most important point to remember when reaching customers through social media is consistency. Negative feedback’s need to be addressed and chances are you will receive more positive than negative. Social media is all about sharing conversation. Restaurants need conversation and what better way to advertise and welcome feedback? You can also use social media for a customer feedback form. Make sure it is easy to access such as a pop up at the site. Again make it short and specific. Some customers will love the convenience of the online forum. There are many ways to capture customer feedback with social media and customer comment cards. Consider both when contemplating your options. Your goal is to capture the attention of your customers to help you evaluate your establishment’s success. Contact us today to see how we can work with you to help meet your restaurant’s needs.